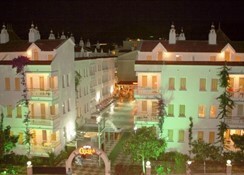 The Club Ceylan Apartments are situated in the popular busy resort of Marmaris on the south coast of Turkey. Club Ceylan offers comfortable one-bedroomed apartments for up to 4 people, an affordable choice for couples and families to enjoy this vibrant resort. There is a casual and friendly ambience at Club Ceylan where guests can soak-up the sun by the pools, refresh at the restaurant and pool bar, and join in with the hosted daily fun activities and lively evening entertainment. Just a few minutes walk brings you to the beach, and the main road of Marmaris, with its many shops, bars and restaurants. Book into the Club Ceylan Apartments and experience the delights of Turkey on a reasonable budget. Getting to the hotel: 90km to Dalaman International Airport (DLM) or 130km to Bodrum-Milas International Airport (BJV). Local tips: Step outside and explore the bustling resort with plenty of shops, restaurants and bars and enjoy the beaches and marina close-by. Take a local dolmus (mini-bus) further afield and explore the neighbouring resort of Icmeler, or take our local excursion to the home of the loggerhead Turtles and Lycian Rock Tombs at Dalyan, just over an hour away. Food, drink and entertainment: Restaurant and bar service, pool bar, serving a wide choice of drinks, snacks and meals throughout the day and evening, there is hosted evening entertainment which includes BBQ nights, karaoke, quiz nights, pool parties, magic shows and other shows and games. Sport, games and activities: Swimming pool, waterslide, sun terraces with loungers & parasols; a variety of daily activities are hosted which include pool dances, water polo, aqua fit, darts, bingo and cocktail games. For the kids: Children's pool, waterslide (working set hours), Kid's club free (6-12 years) organised by a professional entertainer with a range of activities. 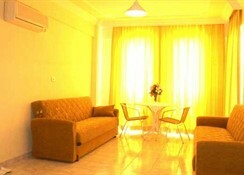 Additional: 24 hour Front Desk services, housekeeping, room service and general tourism advice. Guest apartments are spread over 3 blocks, and are bright and modern with a decor of soft pastel shades and have comfortable furnishings, and have one bedroom with a double or twin beds, a living area with 2 sofa beds, kitchenette with electric cooking rings, fridge and cooking utensils, a furnished balcony, air-conditioning (payable locally), private bathroom with shower, WC and hairdryer, (baby cot free of charge on request).